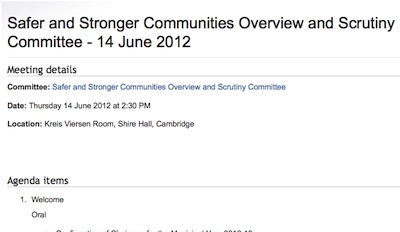 On Thursday the 14th of June 2012 I attended Cambridgeshire County Council’s Police and Crime Scrutiny Committee*. I used the public speaking slot to chase up information on Cambridgeshire Police’s phone answering performance. Cambridgeshire police’s competence at answering the phone in a reasonable period of time dropped significantly last year, following re-organisation of their call handling. I think answering the phone promptly is something absolutely fundamental to running a police service, which has to be got right. Thousands of calls have gone unanswered, and thousands more took too long before they were picked up. We still don’t know the true extent of the problem because the police have not provided either the Police Authority or County Council with data they have requested to allow them to hold the police to account, and help them address the problem. My guess is this is data the police will find embarrassing and they are trying to delay its publication to a point where it is no longer newsworthy – the worst performance – from the data available – appears to have been in summer of 2011. Every unanswered call will have damaged people’s perception of and confidence in the police. Reputations and confidence take a long time to build up and can be easily lost, I fear this episode may have done real damage. In addition its hard to determine its effect on things like reporting and recording of crime and other matters people wanted to get in touch with the police about. At the 14 December 2011 meeting and again at the 9 February 2012 meeting call handling data was promised to the committee by the police. The detail of what was requested, and promised, was information on how badly the target phone answering times were missed in those cases where the target times were exceeded. The currently publicly available data (Performance Statistics presented to the Police Authority) does not show how long, in the worst cases, people have been waiting for the police to answer the phone. We only know in what fraction of cases the police’s performance targets were met. What we don’t know is where those were missed, as they have been in a substantial proportion of cases over the last year, how badly they’ve been missed. We don’t know how many people were waiting on the phone for over say one minute, two minutes, five minutes or how long people were waiting in the worst cases. This is the information the committee requested in December, and chased in February, and has still not received. I am aware some information has been received and has been circulated to the committee today, however the information provided is not the information which was requested. I would like to request the immediate publication of the material supplied, and the publication of the requested material when it is received. I note the information supplied to-date has been marked “restricted”. While I have been given a copy by the council, I note Cllr Steve Tiereny, this committee’s previous chair, was reluctant to share a copy with me due to this marking. The material should be posted on the web, without any protective marking. Inappropriately protectively marked material is difficult for councillors and others to make use of, to share and discuss. It has previously been noted that the Police Authority’s scrutiny committee has also been requesting the information in question. I hope committee members will be aware that the Police Authority’s scrutiny committee has now disbanded itsself (rather prematurely in my view given the Police and Crime Commissioner will not be taking over until November), in light of this I think it is especially important that the committee continue to hold the police to account in this important area of phone answering performance. Do it tactfully and politely, but make sure its very clear what information needs publishing and get a deadline set. So, that is exactly what I am here doing, and that is the request I am making. Just to make sure it’s really clear what is being sought, and what was requested (following my request to the committee in fact) back in December: it’s information on how badly the police have been missing their phone answering targets, over last year and bringing it as up-to-date as possible, so we know, and we have in the public domain, details of how many people were waiting on the phone for over say thirty seconds, a minute, two minutes and on as far as required so the worst cases are covered. The meeting’s chair, Councillor Richard West, and his officers had been taking notes as I was speaking, as I finished he nodded as if to indicate agreement but said nothing. No councillors took up the suggestion I was making, and the committee made no decision to actually chase up the information they were promised. Cllr West told me before the meeting that either the committee would respond to my point between meetings, or an agenda item would be placed on the agenda of their next meeting. I noted that the subject I was speaking on was on that days agenda already, as there was an action point in the minutes, noting the information had been requested. The next meeting scheduled for the Safer and Stronger Communities Overview and Scrutiny Committee is Thursday, 13 September 2012. Cllr Wilkins suggested that would be the committee’s last meeting, saying it would be abolished once the Police and Crime Commissioner was elected. Other councillors appeared unsure of what the arrangements would be post-election of a Police and Crime Commissioner. My view is the committee (or one like it) should remain, and take on some of the work it is doing, in support of the commissioner including reviewing police performance, and investigating and making recommendations on cross-cutting areas such as it is currently doing in relation to road safety and domestic abuse. As I returned to my seat in the public seating area I noted Cllrs Brooks-Gordon and Wilkins had been scribbling notes to each other around the “restricted” marking on the police phone answering data which they had circled. The essence of their scribbles appeared to be noting that it was inappropriate, and shouldn’t have been there, and that something had gone wrong both in the police and the council. I’ve tweeted a link to this article in the direction of those councillors on the committee who tweet, they may be able to explain if we will have to wait until September 2012 for the committee to debate chasing the information it requested in December 2011. If that is the last meeting of the committee, if the information is subsequently obtained, who at the County Council will receive it? *The meeting is formally called the Safer and Stronger Communities Overview and Scrutiny Committee, I describe it as the Police and Crime Scrutiny Committee as I think that’s an accurate and more accessible description in relation to the work it does in this area. This entry was tagged Police on June 15, 2012 by Richard Taylor. It’s pretty poor,they must use this for internal metrics so why not just publish it automatically without being asked? Positive words from these councillors is all well and good after the meeting, but they didn’t do anything during the meeting, where they were in a position to do something, to help get the information published in a timely fashion.